If you ask Les Galantine (Steve Buscemi), he’ll tell you that the difference between himself and his colleagues who also stake out the whereabouts of pop stars trying to snap a candid and hopefully salacious photo is that he’s “a licensed professional” and not a paparazzi. He may say this repeatedly but that doesn’t prevent apt and suspicious viewers from realizing he appears to have the same views and habits of others in the tabloid paparazzi profession. In other words, if it walks like a duck and talks like a duck it’s definitely a paparazzi in Sundance Award winning writer/director Tom DiCillo’s great new “rags to riches fable” Delirious which earned five awards including the AFI Filmmaker Award for Best Director at the U.S. Comedy Arts Festival. 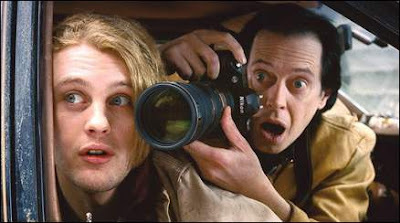 Providing a great counterpart to his reluctant celebrity journalist in his own remake of Theo van Gogh’s Interview, Buscemi’s Les (with a fitting name as Ebert pointed out in his review) in Delirious tells his new young homeless assistant Toby Grace (Michael Pitt) that his real dream is to get signed with an agency to shoot Nike and Calvin Klein ads. However, in the mean time, he lives by his credo of rules such as knowing “where you belong” and assuring Toby that celebrities are “just people, no better than us,” as he trains him in on the ropes of staking out stars with Toby working for free most likely for both companionship and to make his rent as he becomes Les’ roommate sleeping in a closet in his cramped apartment. Schooling the angel faced, sweet Toby in on how to crash benefits and events to take as many goodie bags as they can get their hands on, Les, who feels that friends are people “just sittin’ around waiting for a chance to start talking about himself,” finds himself becoming quite attached to his protégé and feels threatened when Toby catches the eye of the successful Britney like pop star K’Harma Leeds (Alison Lohman) and begins losing him to love. Surprisingly heartfelt with believable turns by both Buscemi, who once again changes into someone completely different right before our eyes, as well as Pitt whose face the camera loves throughout the film in some breathtaking, sharp and exuberant sequences (such as a Singin’ in the Rain styled ode after he spends an evening with Lohman) that most likely came from the innovative vision of director and former Jarmusch cinematographer DiCillo. In DiCillo’s best film in years which unfortunately was granted a limited release in art cinemas in major cities, Buscemi gives one of his finest performances in the 2000’s that, while definitely playing into DiCillo’s satirical fable intention, manages to walk the fine line between parody and truth and I found myself involved all the way. Given an exclusive initial DVD release for rental at Blockbuster, DiCillo’s Delirious is scheduled for a wider rental and purchase release in the future.